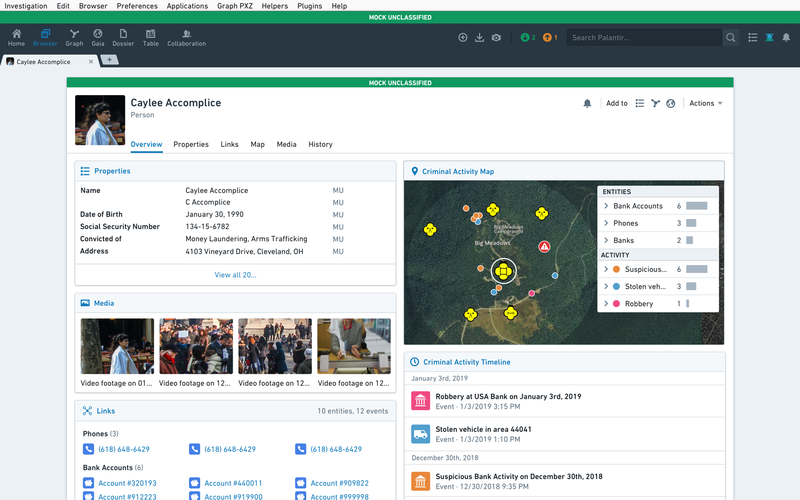 Titan is the next generation of Palantir Gotham, with new capabilities built on 10+ years of learnings from partnerships across battlefields, operations centers, and headquarters around the world. 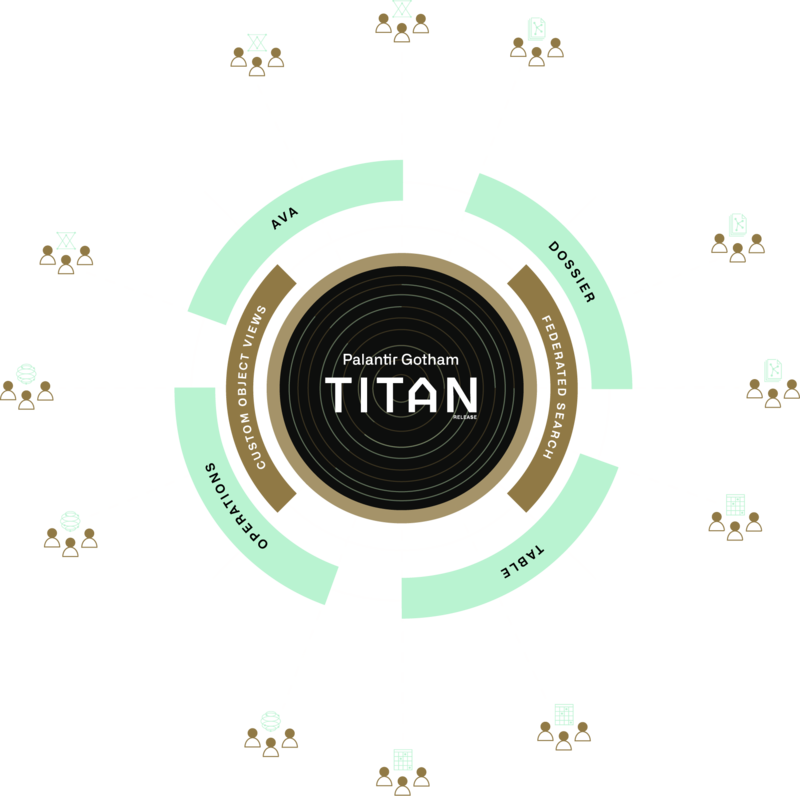 Titan’s platform improvements and new Modules deliver industry-leading innovation, while staying true to Gotham's mission: building an ecosystem that securely integrates data, people, and intelligence, to empower institutions for decades to come. Titan's platform upgrade makes Gotham more performant, open, and proactive, so that the world's institutions can continue turning data into intelligence. Gotham transforms our ability to turn disparate data into knowledge. It is how our organization understands the world — and Titan is a force multiplier. 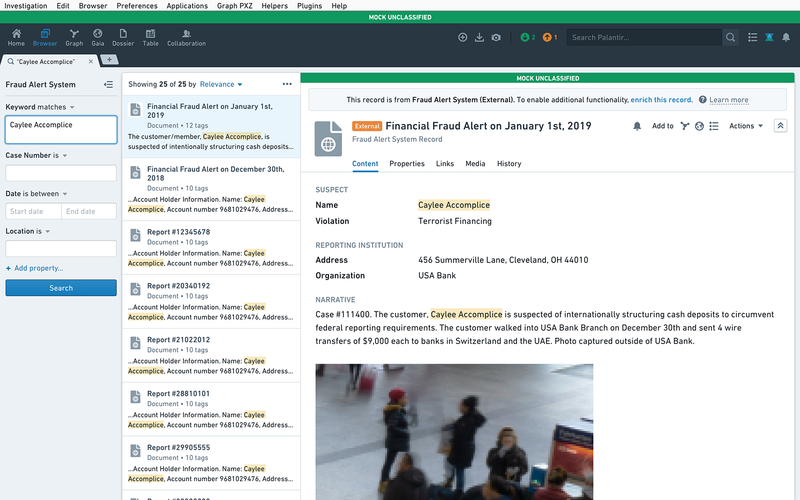 Custom Object Views display tailored intelligence about entities and key records within Gotham, so users quickly get the information they need. The enriched views are configurable to the specific needs of individuals, teams, and institutions, and are backed by Gotham's stringent security protocols. Titan ships with development frameworks and an editing interface for these views, so they evolve with the needs and nuances of each institution. Federated Search extends Gotham's openness by seamlessly connecting the platform with your enterprise's external data systems for search and discovery. 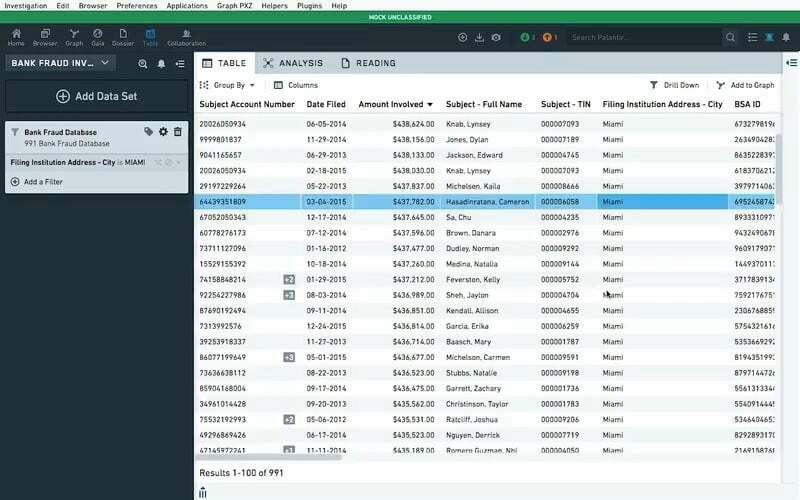 Through a single point of search, your external data systems can be explored with the full computing and analytic capabilities of Gotham. Records of interest can be promoted and fused with Gotham's integrated data asset, respecting the data's provenance and security, with supported frameworks for write-back and export. 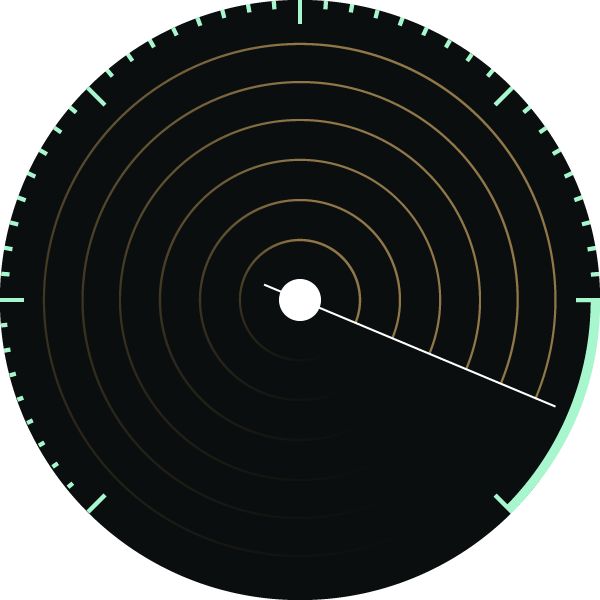 Spend more time analyzing and less time searching with radically improved performance, real-time feeds, and significantly faster download times. Titan is forever modern, with platform improvements delivered without interruption, more frequently than ever before. Expand the power of Gotham with additional premium Modules available on Titan. Modules deliver the latest in artificial intelligence, large-scale data analysis, real-time collaboration, and operational planning to force multiply what institutions can achieve. Each individual Module unlocks transformative workflows from the institution's integrated data asset in Gotham, and also contributes critical new intelligence back. All backed by Gotham's industry-leading auditing, permissions, and data security. With Ava, intelligence never stops.  Ava is the artificial intelligence virtual assistant that runs 24/7 across Gotham's integrated data asset to connect the dots and alert users of potentially relevant connections within their data for human review, so that leads are never missed. Ava finds connections on my cases that would otherwise take me days or weeks — in some instances, reviving cold investigations. 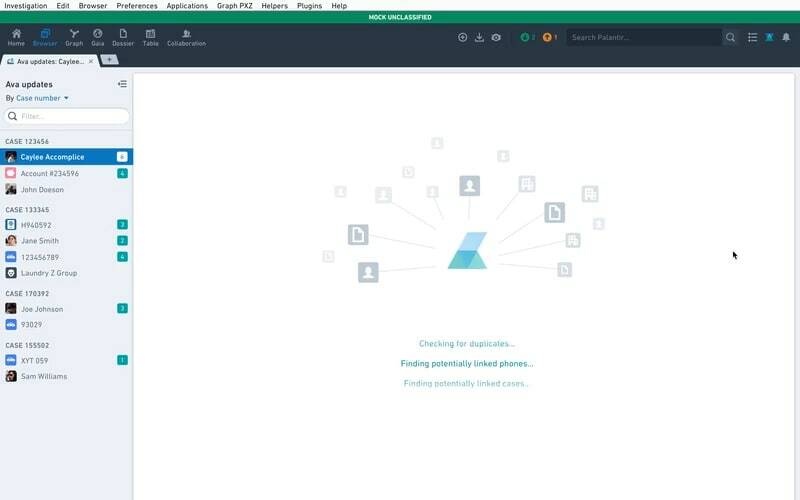 Build dynamic intelligence products as a team with Dossier. 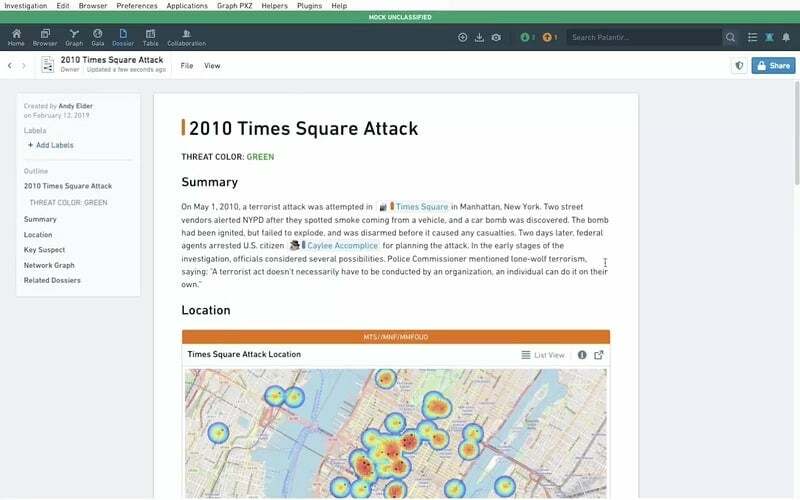 Concurrent document editing enables collaborative analysis and reporting that seamlessly integrates data, graphs, and maps from Gotham, while robust data security allows users to collaborate across access levels with confidence. Dossier extends Gotham as a place to securely capture, contextualize, share, and export data-driven insights. Dossier turns investigations into sharable products. The ability for users to simultaneously create analysis and reports within Gotham takes my organization to the next level. Derive signal from noise in your data with Table. Table breaks down data silos to unite massive-scale data within Gotham's analytical environment. Specialized tools for search and triage make enormous, complex data sets intelligible, accessible, auditable, and actionable in a matter of seconds, not days. Table has opened up unprecedented analyses across billions of records making data previously siloed across different departments available in one accessible and rapidly searchable place. With Operations, mission planning and intelligence become one. 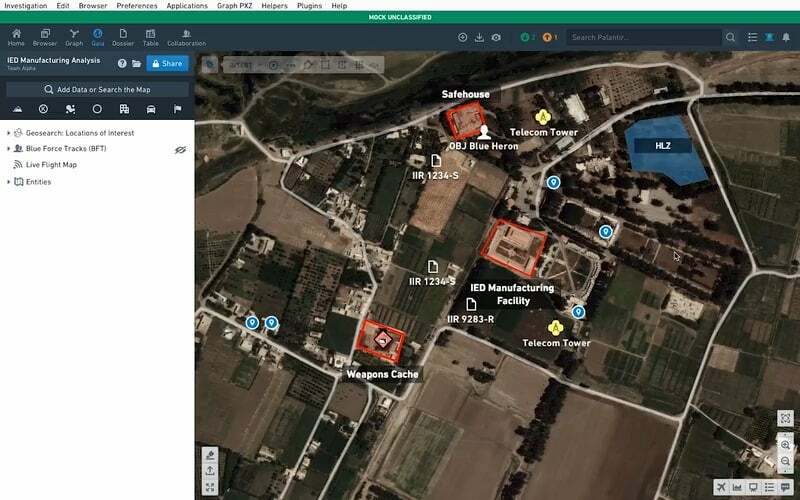 Through its collaborative map application, Palantir Gaia, and a Mobile extension for distributed operations, the Module assembles a live common operational picture for the geospatial planning, training, execution, and documentation of operations for warfighters and first responders around the globe. Gaia is as close as you get to ground truth without being on the ground. Learn more about the Titan ecosystem. All data and information presented in screenshots on this page is notional.